Regardless of whether you're in the middle of a pumpkin blitz or on a paleo diet, there's always time to take a break for newfangled cookie butter. So Sonia and I did, just like the Shellys, and we concur with their assessment of the confection. But now, difficult as it may be, it's time for me to return to my strict regimen of pumpkin-flavored desserts. 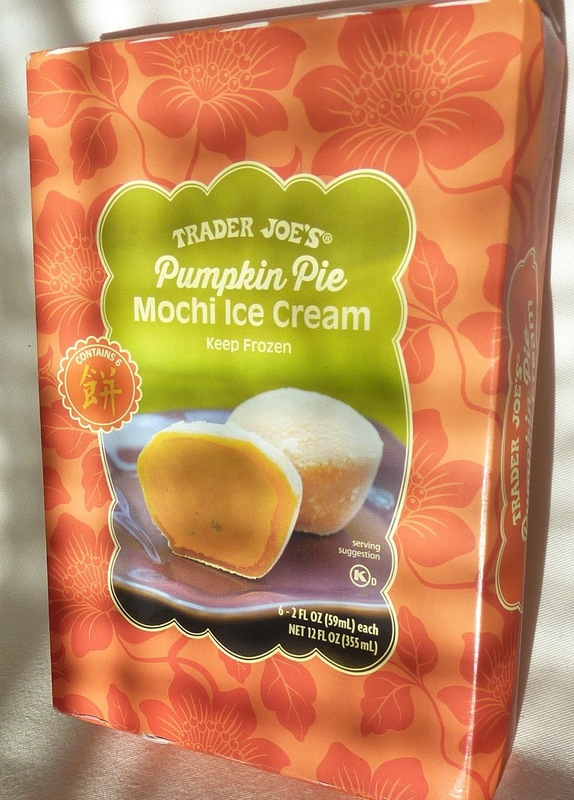 In this particular instance, we're looking at an Asian-inspired treat meets country pumpkin patch meets dairy farm meets Hawaiian-themed grocery store headquartered in California: Trader Joe's Pumpkin Pie Mochi. If you're familiar with mochi ice cream, not to be confused with mochi potstickers, you'll know that it's basically balls of ice cream coated with a thin, chewy, rice-based shell. Scrump-dilly. And just like most other mochi I've tried, the exterior texture of this pumpkin pie variety is soft, gummy, and delicious. As for the taste, well...they're perfectly sweet, pumpkin pie spice-laden, and creamy. Pretty yummerrific. That is, if you like the taste of pumpkin ice cream. 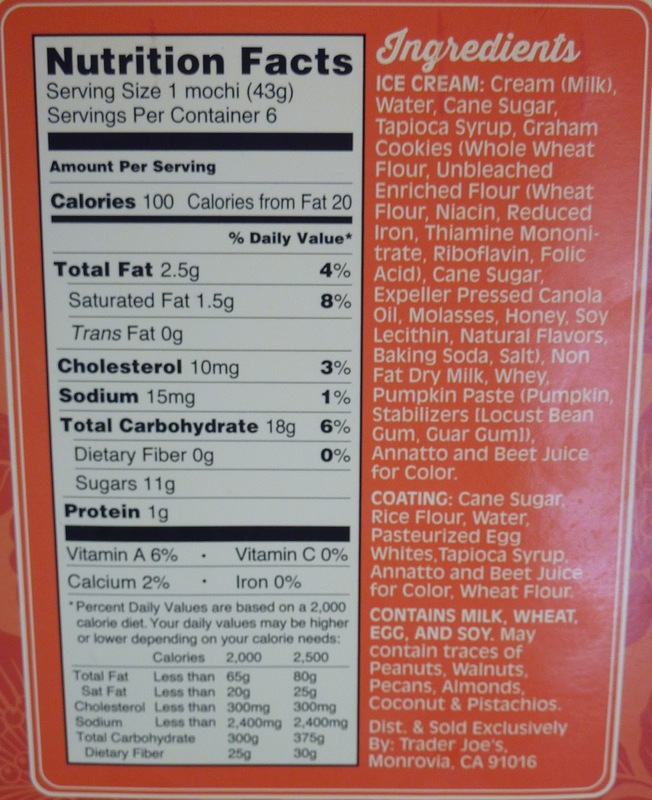 It was very similar to, if not exactly like, Pilgrim Joe's Pumpkin Ice Cream. And if any of you remember that review—or if you decided to click that link just now—you'll know my main issue with that ice cream was a lack of "pie" texture. Even though mochi shells are nothing like actual pie crust, they served the same purpose. They added a bit of breadiness to a product that would have otherwise been too smooth for me. Plus there were, in fact, a few crumbs of graham cookie scattered sparsely throughout the ice cream. Even though I would have loved a lot more of the cookie bits, they still added an extra hint of pie-ish-ness. So in that way, I found this product to be much more impressive than its counterpart in a quart cup. Value-wise, you're getting more ice cream for your buck with Pilgrim Joe's, but in my opinion $3.49 for six mochi is well worth the money. Plus, it's a seasonal item, so it's not like you're going to be purchasing it all the time. 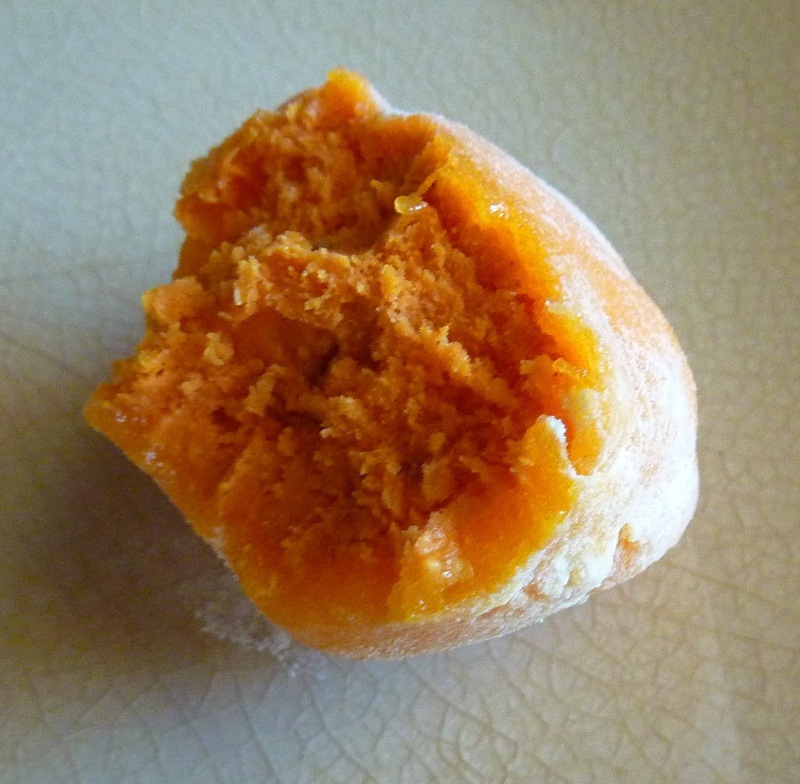 All in all, I'm pretty impressed with pumpkin pie mochi, and I have to give it a big thumbs up with 4.5 stars, but with one final note: Try letting them thaw for a few minutes before shoveling them down your gullet, if you can. There's enough texture from the cookie crumbs and mochi shell, so in my opinion, the whole product is better if the ice cream is just a tad melted. Sonia gives these little guys 3.5 stars, adding that the pumpkin flavor in the mochi wasn't strong enough, and that she needed to eat three of them before the flavor built up on her taste buds enough to tell it was pumpkin. Where is this stuff made? I hate when food labels only tell you who distributes a product and not its country of origin. There is a company in Hawaii that makes mochi ice cream products, so I hope it's them! I wish I knew! It reminds me of Mikawaya mochi, but I have no idea if that's TJ's supplier for this product or not.